Thank you Blue Diamond Almonds for sponsoring this post. The inspiration for this recipe comes from the California sushi roll. Typically, the California roll is made with Kani, or imitation crab. I didn’t want any of that going on in this cucumber noodle bowl so I turned to shrimp. Which worked out well, considering the grocery store I shop at had wild caught shrimp on sale. WIN! When I order sushi, sometimes I order a roll that is topped with “crunch” which is usually Japenese panko. I wanted to give my cucumber noodle bowl a little crunch so I turned to the complimentary Sriracha Almonds that I received from Blue Diamond Almonds. Perfect, I thought. I’ll chop some of those almonds in my food processor and sprinkle them on top of the cucumber noodle bowl. Blue Diamond Almonds make a variety of almond flavors, one of their newest flavors is the Sriracha flavor. These almonds are perfect for snacking, especially if you’re a fan of sriracha and all things spicy like I am. 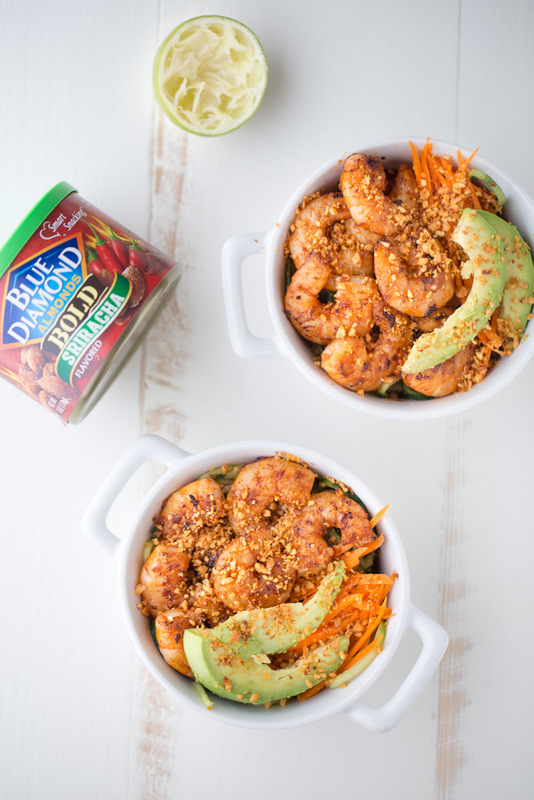 The shrimp is tossed in a marinade made using sriracha sauce, olive oil and fresh garlic. 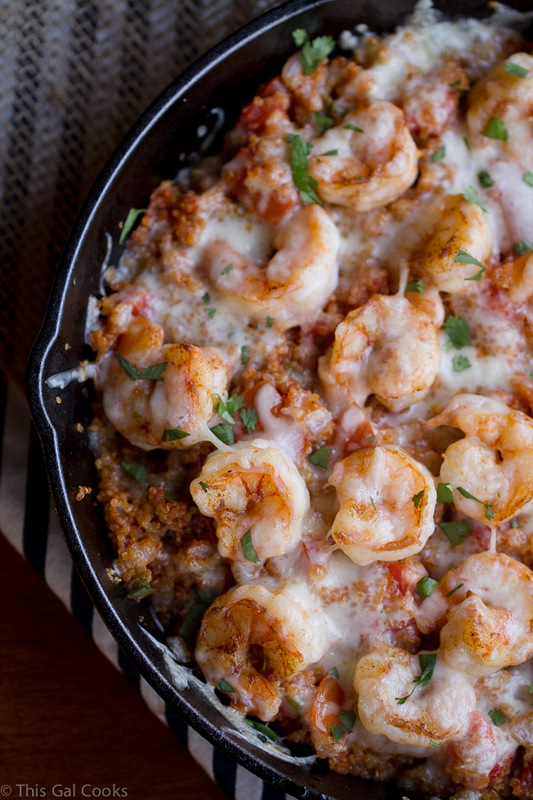 The shrimp is cooked on a skillet, 1-2 minutes per side. 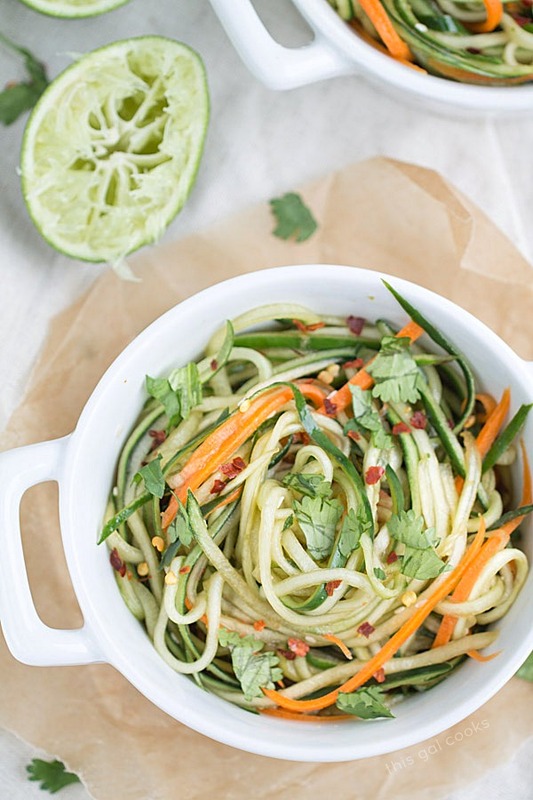 To make cucumber noodles, you’ll need a spiralizer or a julienne peeler. I use this spiralizer but I’ve also used this julienne peeler to make noodles. used it to make the shredded carrots used in this recipe. The cucumber noodles are tossed with homemade ponzu sauce. You can used store-bought ponzu but why not make it? It’s easy to make. 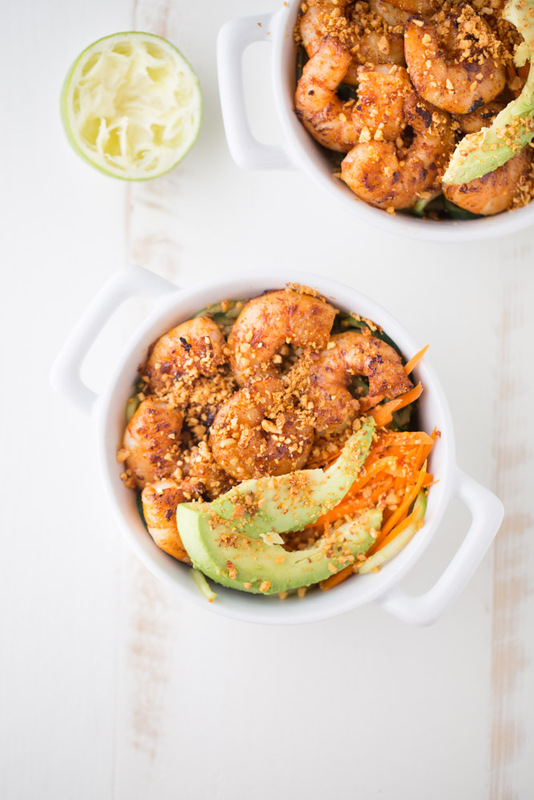 To assemble the bowls, place the noodles in two bowls and then top with cooked shrimp, shredded carrots, sliced avocado and chopped Sriracha Almonds. ½ lb large shrimp (about 14 shrimp) peeled. Use wild caught, if you can. 2 tbsp ponzu sauce. Use this recipe to make your own. In a mixing bowl, whisk together the olive oil, sriracha and minced garlic. Add the shrimp and toss to coat. Set aside. Sprialize the cucumbers. Break apart the noodles into smaller strands. Place in a mixing bowl and toss with a pinch of salt. Set aside. Chop the almonds in a food processor. Heat a skillet over medium high heat. Add the shrimp and cook 1-2 minutes per side. **If using a stainless skillet, spray with cooking spray or coat with a little olive oil before adding the shrimp. Assemble the bowls. Toss the cucumber noodles with 2 tbsp of ponzu sauce. Divide the noodles between two serving bowls. 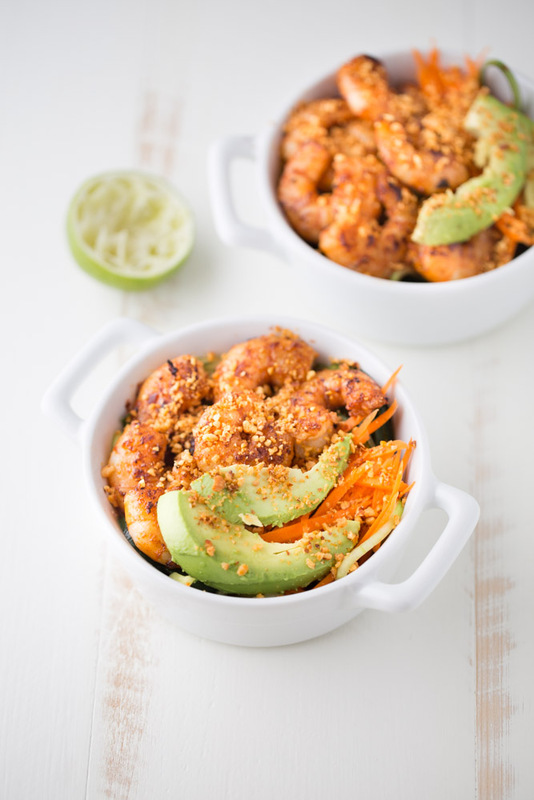 Divide the shrimp, carrots and avocado between each bowl, placing them on top of the noodles. Sprinkle each bowl with ½ tbsp of the chopped almonds. This post was sponsored by and compensated for by Blue Diamond Almonds. All opinions, photos, recipe and content are my own. I wish I had this bowl for lunch! I have been wanting to try the sriracha almonds. I love the kick of spice they add to the shrimp, cucumber and other flavors! The sriracha almonds are great. I think you would like them, Ashley! Love the contrast of the spicy flavors with the creamy avo and cooling cucumber! Glad you like it, Medha! It’s a great combo. What an awesome idea! I love the idea of an inside out sushi roll! I will be making this asap! Thanks Kelley! Hope you enjoy them! I love the sound of everything in this noodle bowl! It looks so colorful and pretty. The sriracha almonds are so so good and what a great idea to add them in here! Love this! I have these almonds, too and I LOVE the way you used them – so creative! Oh yum! This looks delicious!! !